An international team of astronomers has found the most distant gravitational lens yet — a galaxy that, as predicted by Albert Einstein’s general theory of relativity, deflects and intensifies the light of an even more distant object. The discovery provides a rare opportunity to directly measure the mass of a distant galaxy. But it also poses a mystery: lenses of this kind should be exceedingly rare. Given this and other recent finds, astronomers either have been phenomenally lucky — or, more likely, they have underestimated substantially the number of small, very young galaxies in the early Universe. Light is affected by gravity, and light passing a distant galaxy will be deflected as a result. Since the first find in 1979, numerous such gravitational lenses have been discovered. In addition to providing tests of Einstein's theory of general relativity, gravitational lenses have proved to be valuable tools. Notably, one can determine the mass of the matter that is bending the light — including the mass of the still-enigmatic dark matter, which does not emit or absorb light and can only be detected via its gravitational effects. The lens also magnifies the background light source, acting as a "natural telescope" that allows astronomers a more detailed look at distant galaxies than is normally possible. Gravitational lenses consist of two objects: one is further away and supplies the light, and the other, the lensing mass or gravitational lens, which sits between us and the distant light source, and whose gravity deflects the light. When the observer, the lens, and the distant light source are precisely aligned, the observer sees an Einstein ring: a perfect circle of light that is the projected and greatly magnified image of the distant light source. Van der Wel wanted to find out more and started to study images taken with the Hubble Space Telescope as part of the CANDELS and COSMOS surveys. In these pictures the mystery object looked like an old galaxy, a plausible target for the original observing programme, but with some irregular features which, he suspected, meant that he was looking at a gravitational lens. 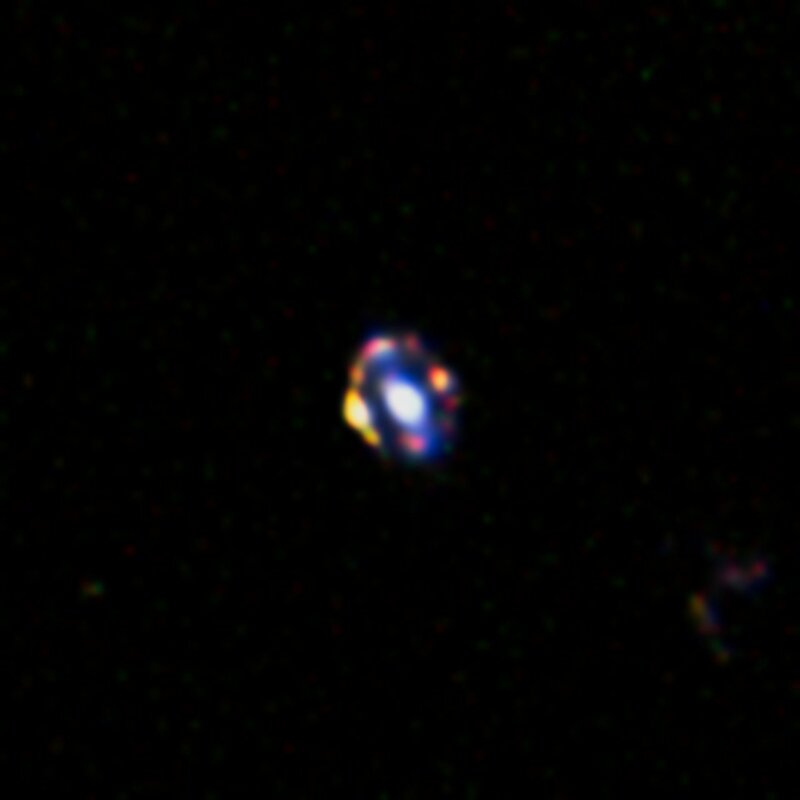 Combining the available images and removing the haze of the lensing galaxy's collection of stars, the result was very clear: an almost perfect Einstein ring, indicating a gravitational lens with very precise alignment of the lens and the background light source . The lensing mass is so distant that the light, after deflection, has travelled 9.4 billion years to reach us . Not only is this a new record, the object also serves an important purpose: the amount of distortion caused by the lensing galaxy allows a direct measurement of its mass. This provides an independent test for astronomers' usual methods of estimating distant galaxy masses — which rely on extrapolation from their nearby cousins. Fortunately for astronomers, their usual methods pass the test. But the discovery also poses a puzzle. Gravitational lenses are the result of a chance alignment. In this case, the alignment is very precise. To make matters worse, the magnified object is a starbursting dwarf galaxy: a comparatively light galaxy (it has only about 100 million solar masses in the form of stars ), but extremely young (about 10-40 million years old) and producing new stars at an enormous rate. The chances that such a peculiar galaxy would be gravitationally lensed is very small. Yet this is the second starbursting dwarf galaxy that has been found to be lensed. Either astronomers have been phenomenally lucky, or starbursting dwarf galaxies are much more common than previously thought, forcing astronomers to re-think their models of galaxy evolution. Van der Wel concludes: "This has been a weird and interesting discovery. It was a completely serendipitous find, but it has the potential to start a new chapter in our description of galaxy evolution in the early Universe." The two objects are aligned to better than 0.01 arcseconds — equivalent to a one millimetre separation at a distance of 20 kilometres. This time corresponds to a redshift z = 1.53. This can be compared with the total age of the Universe of 13.8 billion years. The previous record holder was found thirty years ago, and it took less than 8 billion years for its light to reach us (a redshift of about 1.0). For comparison, the Milky Way is a large spiral galaxy with at least one thousand times greater mass in the form of stars than this dwarf galaxy. The work described here has been published as van der Wel et al., "Discovery of a quadruple lens in CANDELS with a record lens redshift z = 1.53" , in Astrophysical Journal Letters. The team is composed of Arjen van der Wel, Glenn van de Ven, Michael Maseda, Hans-Walter Rix (all Max Planck Institute for Astronomy, Heidelberg, Germany [MPIA]), Gregory Rudnick (University of Kansas, USA; MPIA), Andrea Grazian (INAF), Steven Finkelstein (University of Texas at Austin, USA), David Koo, Sandra M. Faber (both University of California, Santa Cruz, USA), Henry Ferguson, Anton Koekemoer, Norman Grogin (all STScI, Baltimore, USA) and Dale Kocevski (University of Kentucky, USA).